Reducing energy consumption in data centres, particularly with the prospect of a federal carbon tax, is pushing vendors to explore an ever-growing range of ideas. Researchers at Hewlett Packard Co.’s HP Labs presented a paper (download PDF) on using cow manure from dairy farms and cattle feedlots and other “digested farm waste” to generate electricity to an American Society of Mechanical Engineers conference held this week. In the paper, the research team calculates that “a hypothetical farm of 10,000 dairy cows” could power a 1 MW data centre — or on the order of 1,000 servers. Later today, as the paper attracted more and more attention, Christian sent a follow-up e-mail noting that HP labs had since received two inquirers about building a demonstration project. “The responses have been quite serious,” he said. Organic matter is already used by farms to generate power through a process called anaerobic digestion that produces a methane rich biogas. 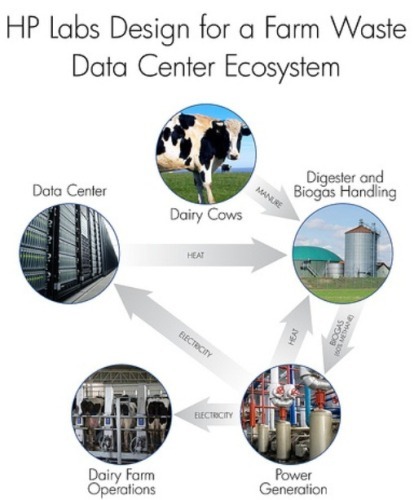 HP’s paper looks at how the process could be extended to run a data centre, starting with the amount of manure produced by your typical dairy cow and working up from there. Another trend that makes the idea of turning organic waste into usable power for data centres is the moves by several firms to build facilities in rural locations, where high-speed networks allow them to take advantage of the cost advantages of such areas. But there are some practical problems, not the least of which is connecting a data centre to the cows. “What’s the reality of getting 10,000 cows in once place?” said Angie McEliece, an environmental consultant for RCM International in Berkeley, Calif., which makes digester systems. The average size dairy farm in the U.S. includes less than 1,000 cows; farms with 5,000 cows is quite unusual, she said. McEliece had not seen HP’s paper, but said the power estimates seem correct for 10,000 cows, though the process wouldn’t be practical. She noted that other organic data centre energy sources, such as landfills and waste from food manufacturers, be examined as well. The U.S. Environmental Protection Agency, according to this study, estimates that there are 125 operating digester projects at commercial livestock facilities in the U.S. In 2008 they produced, in total, 290 million kWh, according to HP’s research.